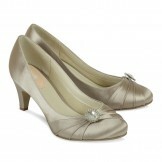 Ivory bridal Shoes have been the popular choice among Brides for many years. At The Wedding Boutique we have the very best in Ivory bridal shoes, wedding Shoes and Occasion shoes from the country’s leading specialists in this industry. 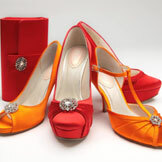 Made from satin, silk or lace you will be assured of a quality product to meet all budgets. The majority of the ivory satin bridal shoes are completely dyeable, to any colour or shade, giving you unlimited options for your special day. This particular service is a popular choice for Mothers of the Bride and Groom, ensuring that she has the perfect matching accessories to her outfit. Our Tip: It’s a good idea to create an account on our website, then add all your favourite ivory wedding shoes or accessories to a wish list. This, in turn, can then be shared with your friends to enable them to help you with your choices. Ideal if you have bridesmaids spread across the country or, indeed, the world! Would you like us to colour these shoes for you ?